I left at 9 in the morning, which gave me up to 15 hours to make the boat at Calais. The weather was bright and clear once again, so I was expecting a clean run. The French customs officials were quite taken aback by the absence of duty free booze and fags (cigarettes for our American cousins) in the car, but nodded knowingly when I explained it was because I am a veloskier. Then it was time to settle into the routine of burning up the miles of endless French roads, hitting the traffic of Paris around 6pm and making it to the coast around 10pm. I was able to get an earlier sailing, found a comfy chair and passed the short voyage in slumber. Once off the boat I was home in an hour. 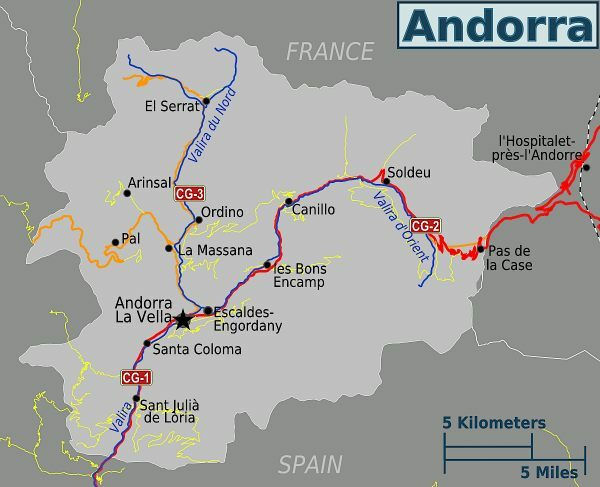 Settling into my own bed and listening to the South London soundtrack of police sirens, it was hard to imagine that I had started the day in the peace and tranquillity of Andorra. I think I am going to miss it a lot.....I'll have to go back again. After days of fine weather the BBC weather site predicted that it would snow overnight, which seemed impossible as I had sat outside the hotel around 7pm the previous evening. However it did snow, over breakfast I asked the hotel proprietor if there would be a problem getting to Arcalis. No problem, he replied, brother in law had salted the road! He also said that there would be 2" of snow, he was correct on both counts. I arrived around 10 and spent a few hours revisiting the familiar runs but now totally transformed by the changed conditions. Unfortunately visibility worsened in the early afternoon to the point were it was hard work seeing the piste markers. As ever one can but hope it improves your technique. I noticed that there was quite a lot of play in the front ski, I returned to the car park to investigate further. A quick adjustment of the "bearing cups" sorted it; this was the first attention the skibike had needed in over 2 weeks on the snow. Hats off to Marin and Alpine Skibikes. Late in the afternoon matters improved markedly enabling me to get in some slightly more enjoyable runs on fresh deep snow. Something very unexpected happened, whilst queuing for my fast run, a guy came running over to me with great excitement. I braced myself for a barrage of questions but it turned out he too was a fellow skibiker. Joan had converted a GT hard tail mountain bike with the K-Trax system. If you haven't come across these before follow the link; the rear wheel is replaced with a tank track and the front by a short ski. This enables you to pedal on the flat or even uphill, if you have the energy. It was only his second day skibiking and his first time using a chairlift. He seemed to get the hang of it far too quickly he set off on the blue run to practice his technique. Having become more confident, I suggested that we move higher up the mountain and later across to the Pal sectors too. By late afternoon Joan was tiring, so we split apart with an agreement to meet later. I went over every combination of run at Pal before crossing back to Arinsal. Near the end the day I threw all caution to the wind and had my first go on the Tub del Col black run. The combination of steep, narrow and heavy wet snow got the better of me, or as a friend later commented... "YARD SALE"...(there were bits of me scattered all over the hill). The first priority was to locate my foot skis, luckily they weren't buried or at the bottom of the hill. Then you have to get the compacted snow of the bottom of your ski boots so that you can then try to get them clipped back in, do one foot at a time, downhill footski first. 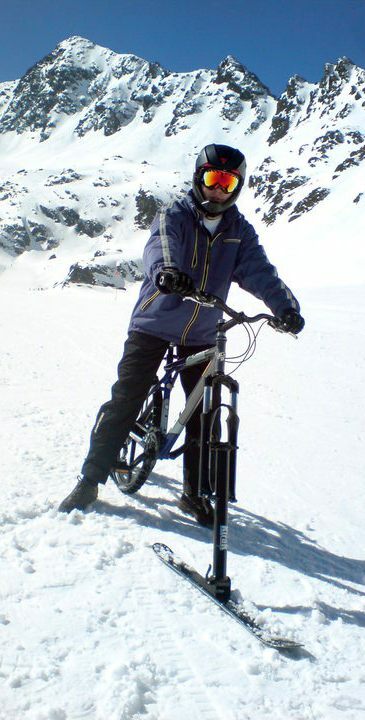 You can then side step up or side slip down to your skibike before remounting and heading off. I had to do this twice on the one run. I had found my limit, it was time to call it a day. Joan had dutifully waited for my return and I convinced him that tomorrow we should investigate what possibilities Arcalis would have to offer. I did a couple of quick warm up runs on the Port Vell to get my legs and brain started, then took the big Arinsal-Pal cable car across to the Coll de la Botella, to play on the Posellettes and Font Roja runs. I also sampled running off piste under the chairlift and through the trees. Font Roja is now becoming another favourite run, with some very exiting gradients and plenty of room to manoeuvre, it is surprisingly empty for such a good run. Sadly my camera ran out of juice and there is no footage of it. I went back up to the top of the Pic del Cubil and then along the Cami Superior till it met the Coms run. It had a monster mogul field but was very slushy by this point and with just a couple of hours left to play made my way back to the Arinsal sectors. I completed a perfect day on my favourite La Pala/Tub de Col combo which had a short gully section to explore. I ventured off-piste around the environs of the La Capa run and wouldn't stop till all the lifts were closed and the slow was totally slushy at the bottom. I realised that unlike skiing, skibiking works well on slush and you can carves your way through the heavy stuff like a jet ski on water. You need to use your footskis as little as possible as they can get caught by the heavier mounds, throwing you off balance or worse. You need to keep up your speed, follow the fall line much closer and avoid making unnecessary turns. I sorted my lift pass and insurance in the morning then took the gondola from El Oriols up to Camallempla and straight on to the Les Fonts chairlift for some good warm up sessions on the blue runs of Port Vell. Why is it that you get to do your first and most wobbly runs of the trip on freshly waxed, slippery skis and when the snow is at its most icy and hardest? The weather was still a little blustery and snow blown especially higher up the mountain but became sunnier throughout the day. I moved up to the Port Negre chair and alternated between the Tub Estadi, Tub del Col and La Pala runs. I began riding much more confidently. It was getting decidedly softer lower down the hill but still pleasantly firm at the top. I finished the last run of the day with a gentle descent down Bony Vagues and Les Fonts. It was horrendously slushy most of the way! I grabbed a couple of well earned apres ski pints and had an interesting chat with the proprietor of the Derby Irish bar. Over the Easter break I was supposed to be helping sail a boat up the Baltic from Travemunde in Germany to Aarhus in Denmark, but as the Baltic was still partly iced over and the Captain had been unwell, plans had to be delayed till June. This left me with another handy gap in my diary and ever since my trips to Scotland I had been aching to explore some larger ski domains. I considered at the French Alps, but the price for an independent traveller was too much, so I turned my searches west to the Pyrenees and the principality of Andorra. Eventually I settled on Vallnord which, unlike Grandvalira, (boo hiss) allows skibikes. Once again LateRooms provided details of some budget accommodation right next to the telecabine station in Arinsal. I left home at 06:00 to check in at 07:30 for a 08:30 sailing from Dover to Calais. I was lucky that I had booked to go via P&O as SeaFrance were on strike on that day. I had a perfect crossing in bright sun and sea as smooth as a mill pond. On the French side I fitted beam converters to the car's headlamps and began the long drive South. My route took me via Paris, why does the Perepherique run so close to the centre of Paris? I had horrid bottle necks to contend with and the worst examples of French driving imaginable. Something odd was going on with my sense of smell, the whole of France seemed super smelly, but in a nice way; the Pas de Calais smelled of Crisps and Paris of French Fries, perhaps my body was telling me to eat more. I intended to drive till sunset and get as far south as possible, yet still get a room for the night. Just after Limoges, I spotted a building high up on a hill side with the word Hotel on the side in faded letters. A quick double back at the next interchange found me outside the empty looking Hotel de la Malyerie in Sadroc, luckily it was open and the proprietors were having dinner. I was shown to my clean, simple and quiet room. After freshening up I sat down to a delicious Omlette with Cepes (wood mushrooms), french fries and salad, all washed down with a glass of Primus blond beer. Tired but not yet fully sleepy I took an evening stroll around the lovely rustic town, sympathetically restored; the air was filled with the pungent smell of wood smoke and damp fertile earth. I returned to the hotel by torchlight along a country lane and slept well that night.